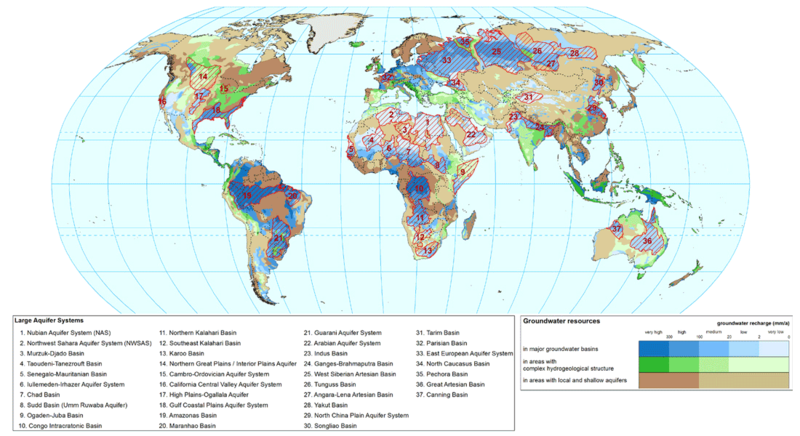 However they also apply to renewable transboundary aquifers, the latter application being an overlap with the scope of the UN Convention.128 The 2008 Draft Articles on the Law of Transboudary Aquifers do not apply, however, to an unconfined aquifer that is situated entirely in one state but contributes water to a river that flows from that state into another state.129 This is a contrast to the UN Convention – which does cover such aquifers. Neither the UN Convention nor the 2008 Draft Articles cover a domestically situated confined aquifer, even in circumstances where it may be remotely connected to a transboundary surface water body, or where the aquifer is domestically located, recharged solely from rain and discharges either into the sea or into a second aquifer, or where the other domestically situated aquifer itself is the end point due to evaporation. 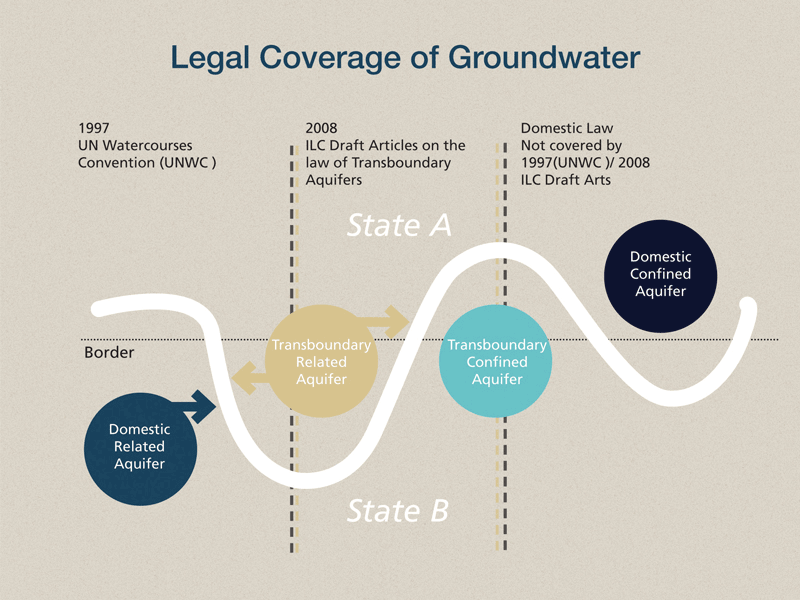 The legal coverage of groundwater is shown in Figure 1.4 on the right. 114 1994 Draft Articles at 90. 115 McCaffrey, The Law of International Watercourses at 497. 116 ‘Confined Groundwater’ was defined by the ILC as ‘groundwater not related to an international watercourse’ in the ILC Resolution on Confined Transboundary Groundwater, see UNGA ‘Report of the International Law Commission on the Work of its Forty-Sixth Session’ (2 May-22 July 1994) UNGAOR, 49th Session Supp No 10 UN Doc A/49/10 (1994) at 135. See also SC McCaffrey, Comments on the International Law Commission’s Draft Articles on the Law of Transboundary Aquifers (2006), 30 March 2008. It may not always be possible to know if an aquifer is confined or unconfined geologically. In this case the storativity can be estimated. This characterises the capacity of the aquifer to release groundwater from storage in response to a decline in hydraulic head or water pressure. A confined aquifer has very low storativity. para 11 and A/CN.4/462 para 2-11. 118 Several commentators argue that confined aquifers were not the only types of aquifers excluded by the Convention. The argument here is that the requirement of a ‘system of surface waters and groundwaters ‘normally flowing into a common terminus’ renders the Convention inapplicable to aquifers that are recharged solely from rain and discharge either into the sea or into another aquifer or where the aquifer itself is the end point due to evaporation. K Mechlem, ‘Moving Ahead in Protecting Freshwater Resources: The International Law Commission’s Draft Articles on Transboundary Aquifers’ (2009) 22 Leiden Journal of International Law 801 at 806. See also C Behrmann & R Stephan, ‘The UN Watercourse Convention and the Draft Articles on Transboundary Aquifers: The way ahead’ UNESCO-IAP-UNEP Conference, Paris, December 2010. 119 Resolution on Confined Transboundary Groundwater,in Report of the International Law Commission on the Work of Its Forty-sixth Session,  UN Doc. A/49/10 at 135. 120 UN WWAP Side Publication Series, ‘Freshwater and International Law: The Interplay between Universal, Regional and Basin Perspectives’ (2009) at 4. 121 UNESCO IHP-VI Series on Groundwater, ‘Non-renewable groundwater resources: A guidebook on socially sustainable management for water-policy makers’, 2006. 122 The word fossil aquifer is sometimes (incorrectly) used interchangeably with confined aquifer. Confined is not necessarily fossil. Whether an aquifer is confined or not is a matter of pressure, whereas the term fossil refers to the age of the water contained in these aquifers, which is so old that it has inspired the use of terminology borrowed from paleontology, ‘Fossil Aquifers’, or non-renewable. see UNESCO IHP-VI Series on Groundwater, ‘Non-renewable groundwater resources: A guidebook on socially sustainable management for water-policy makers’, (2006), preface. Also see Report of the International Law Commission to the General Assembly on Its Fifty-Fourth Session, UNGAOR, 57th Sess., Supp. No. 10, UN Doc. A/57/10 (2002), at 243 para. 519. 123 Report of the International Law Commission to the General Assembly on Its Fifty-Sixth Session, UN GAOR,56th Sess., Supp. No. 10, 2004, UN Doc. A/59/10, 126–7, paras. 89–92; K Mechlem, ‘Moving Ahead in Protecting Freshwater Resources: The International Law Commission’s Draft Articles on Transboundary Aquifers’ at 804. 124 For commentary, see S McCaffrey ‘The International Law Commission Adopts Draft Articles on Transboundary Aquifers’ (2009) 103 American Journal of International Law 272 at 282. 125 International Law Commission, Draft Articles on the Law of Transboundary Aquifers (21 February 2008) UN Doc. A/CN.4/591, Art. 2. 126 McCaffrey ‘The International Law Commission Adopts Draft Articles on Transboundary Aquifers’ at 282; O McIntyre ‘International Water Resources Law and the International Law Commission Draft Articles on Transboundary Aquifers: A Missed Opportunity for Cross-Fertilisation?’ (2011) 13 International Community Law Review at 237. 127 International Law Commission, ‘Draft Articles on the Law of Transboundary Aquifers’, UN Doc. A/CN.4/L.724, 29 May 2008, Yearbook of the International Law Commission, Geneva; United Nations Publications, p.19; UNGA “The law of transboundary aquifers”, UN Doc. A/RES/63/124, 15 January 2009. 128 One of the criticisms of the 2008 Draft Articles is that this overlap with the UN Convention will cause confusion over which instrument applies. 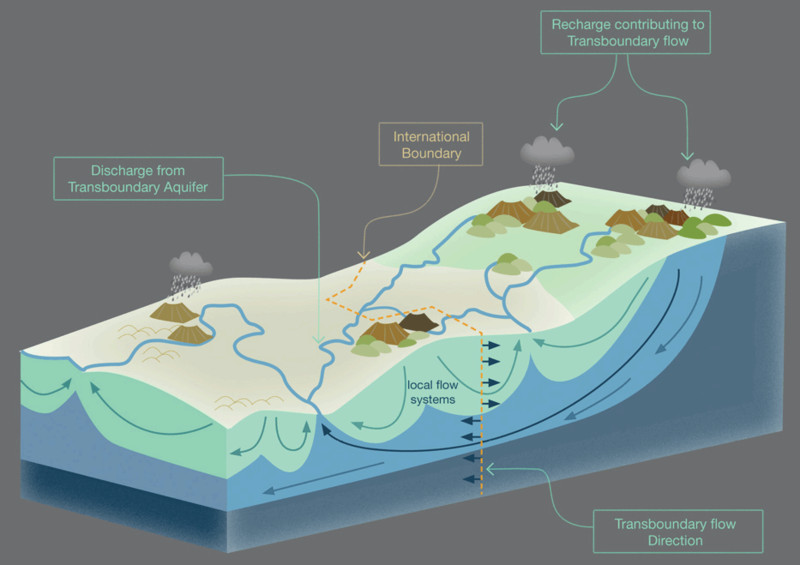 See McCaffrey, Comments on the International Law Commission’s Draft Articles on the Law of Transboundary Aquifers at 4. 129 Mechlem, ‘Moving Ahead in Protecting Freshwater Resources: The International Law Commission’s Draft Articles on Transboundary Aquifers’ at 809. 130 The Articles exist currently as an Annex to General Assembly Resolution, A/RES/63/124. The UNGA recommends that states make appropriate arrangements bilaterally or regionally for the proper management of transboundary aquifers on the basis of the principles enunciated in the draft articles (Preamble, para 5). The General Assembly was scheduled to consider the elaboration of a convention on the basis of the draft articles in its 66th Session in 2011. 131 C Yamada, Fifth Report on Shared Natural Resources: Transboundary Aquifers, UN Doc. A/CN.4/591 (2008), at 14–15, paras. 38–40. 132 Refer to Part II for a more specific discussion of sovereignty. 133 McCaffrey, Comments on the International Law Commission’s Draft Articles on the Law of Transboundary Aquifers at 6-7. Also see S McCaffrey ‘The International Law Commission Adopts Draft Articles on Transboundary Aquifers’ (2009) 103 American Journal of International Law at 272-293. 134 O McIntyre ‘International Water Resources Law and the International Law Commission Draft Articles on Transboundary Aquifers: A Missed Opportunity for Cross-Fertilisation?’ (2011) 13 International Community Law Review at 237. 135 For another point of view on this alignment see C Behrmann & R Stephan, ‘The UN Watercourse Convention and the Draft Articles on Transboundary Aquifers: The way ahead’ UNESCO-IAP-UNEP Conference, Paris, December 2010. 136 Image adapted from S Puri and others, ‘Internationally shared aquifer resources management, their significance and sustainable management: A framework document’ IHP-VI International Hydrological Programme Non-Serial Publications in Hydrology SC-2001/WS/40 (UNESCO 2001). 137 UNESCO, ‘Transboundary Aquifers: Managing a vital resource – The UNILC Draft Articles on Transboundary Aquifers’ (UNESCO 2009); WHYMAP and Margat, ‘Groundwater Resources of the World’ (2008).